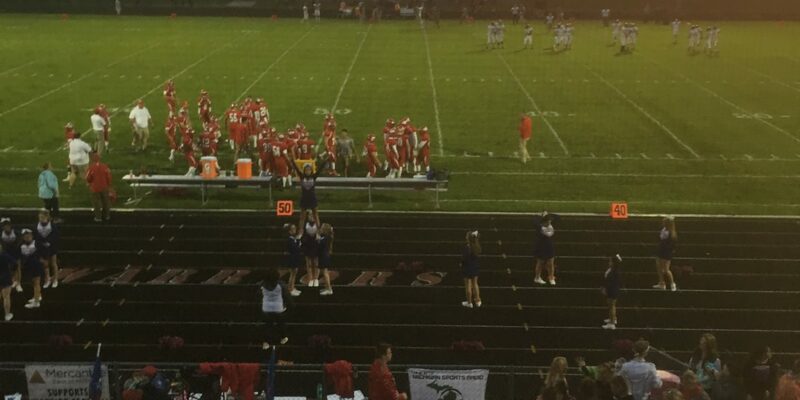 After defeating Big Rapids a week ago, the Tri-County Vikings hit the road to take on Remus Chippewa Hills. A stout defensive effort led the Vikings to their second consecutive win, this time 12-0. After a scoreless first quarter, Tanner Ching ran it in from five-yards out. The extra point was unsuccessful however, so Tri-County led 6-0 heading into the locker room. The Vikings offense would get six more points as Nick Braunschneider would connect with Bryce Hallman for a 60 yard pass to move them into the red zone before Tanner Ching punched it in. Chippewa Hills had two drives that were promising, but the Vikings’ defense stepped up and made big plays. Bryce Dube would recover a fumble on the 5 yard line, and Cam Friend had a diving catch interception that sealed the victory for Tri-County. The Core Power Co-Players of the game were Tanner Ching, who had 30 carries for 130 yards for 2 Touchdowns, and Nick Braunschneider who was 9-12 for 140 yards. The Vikings have found a quarterback in Braunschneider, who has already helped turn around Tri County’s previous seasons. The Vikings have now won more games this year than the 2017 season. Next week, they will aim for their first three-game winning streak since 2004 when they host Reed City next Friday. Dave Princer and Joe Nagy will be on the call for this game and all of the Vikings’ games this season. You can listen to this game live on the Michigan Sports Radio app or at the LISTEN LIVE page on the website.